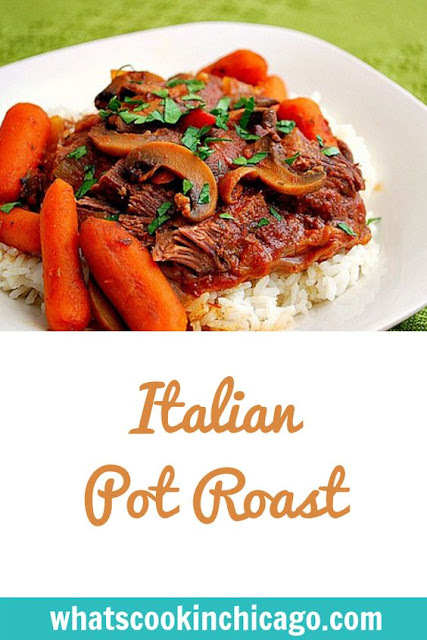 Article first published as Italian Pot Roast on Blogcritics. 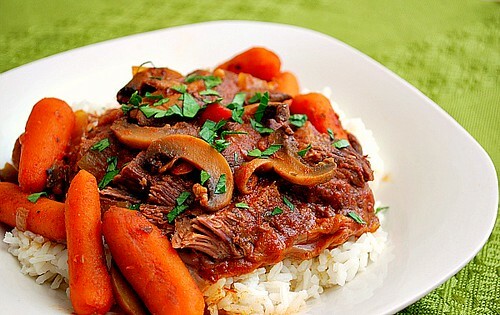 Pot roast is one of those dishes I especially love during the fall and winter months. There's the comfort food aspect but even more than that, it's a dish that tastes like it required so much time involved. The truth is, if you prepare it in a slow cooker, it's relatively an easy and quick dish to prepare, leaving the slow cooker to do all the work and let the flavors shine through. There's a few things I really liked about this recipe. First, the meat was super tender and flavorful. No knife needed here to cut through the beef. Second, the gravy this made was rich with Italian flavors. The red onion, oregano, tomatoes, red pepper flakes and mushrooms gave it the Italian touch and worked beautifully. And lastly, the ease in preparing this made it all worth it. After a long day full of things to do and places to go, it was a wonderful feeling to sit down to a meal I only spent a few minutes on. Oh, and let's not forget the leftovers! These make great leftovers as well! Cook bacon in a 12-inch skillet over medium heat until crisp, 5-7 minutes; then transfer to a slow cooker. Pour off all but 2 tablespoons of bacon fat left in skillet. Add the onions, carrots, garlic, oregano, tomato paste, mushrooms, and red pepper flakes to fat in skillet and cook over medium high heat until vegetables are softened and lightly browned. Stir in the wine, scraping up any browned bits and transfer to slow cooker. Stir in the tomatoes, broth and bay leaves into the slow cooker. Season the roast with salt and pepper and nestle into the slow cooker. Cover and cook until the beef is tender, 9 to 11 hours on low or 5 to 7 hours on high. Transfer roasts to cutting board, tent loosely with foil, and let rest for 20 minutes. Let the braising liquid settle for 10-15 minutes as the roasts rests and then skim the fat from the braising liquid using a large spoon. Discard the bay leaves and stir in the parsley. Season with salt and pepper to taste. Slice the roast into 1/2 inch thick slices, and arrange on a serving platter or serving dish. Spoon some sauce over the meat and serve with more sauce on the side. I just ordered that book from Amazon. I think this will be the first recipe I try. It looks very very good. How do you like this cookbook? I am expecting next month and want to buy a slow cooker cookbook for when the baby comes and I have less time to cook. There are so many out there! Do you find that its recipes are healthy AND tasty? RoMiGu - I absolutely love this cookbook! I'm not a fan of processed/canned cream soups that are often used in many crockpot recipes... and this cookbook rarely calls for them. The cookbook utilizes the crockpot as a means to braise, simmer and cook meals using whole foods wherever possible and doesn't rely on processed foods to make crockpot meals. Two thumbs up from me!